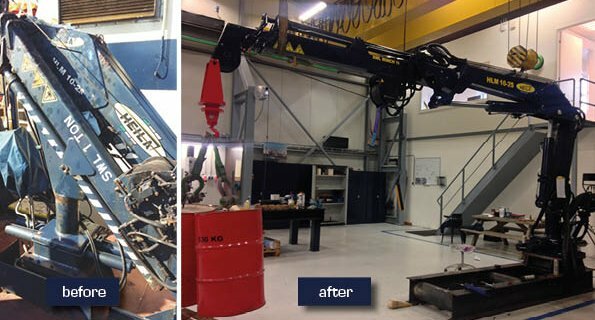 Recently, Heila Waalwijk, the Netherlands, overhauled a HLM 10-2S crane installed on one of Svitzer IJmuiden’s vessels. Svitzer, with 550 vessels in 35 countries, is one of the world’s largest harbour tug and salvage companies. “The crane had been mounted on one of the salvage vessels for more than ten years and was in need of an overhaul”, explained Michiel Eijskoot, Superintendent at Svitzer IJmuiden, where he is responsible for nine vessels. “A Heila service engineer dismantled the crane on board the vessel. It was then taken to Heila’s workshop in Waalwijk”. Heila overhauls cranes according to a standard procedure. In the specially equipped workshop, the crane is disassembled completely. All of the structural components are then checked and repaired or replaced. A coating system is then applied and the crane is sprayed in the desired colour. After being reassembled, Heila retests the crane to check that all the functions operate correctly. Michiel Eijskoot: “The overhaul of the HLM 10-2S went problem free. The crane is now back on board the salvage vessel and is as good as new”.